Little, Brown Books for Young Readers, 9780316514392, 96pp. From former Chief Official White House Photographer Pete Souza comes a book for young readers that highlights Barack Obama's historic presidency and the qualities and actions that make him so beloved. Pete Souza served as Chief Official White House Photographer for President Obama's full two terms. He was with the President during more crucial moments than anyone else - and he photographed them all, capturing scenes both classified and candid. Throughout his historic presidency, Obama engaged with young people as often as he could, encouraging them to be their best and do their best and to always "dream big dreams." In this timeless and timely keepsake volume that features over seventy-five full-color photographs, Souza shows the qualities of President Obama that make him both a great leader and an extraordinary man. 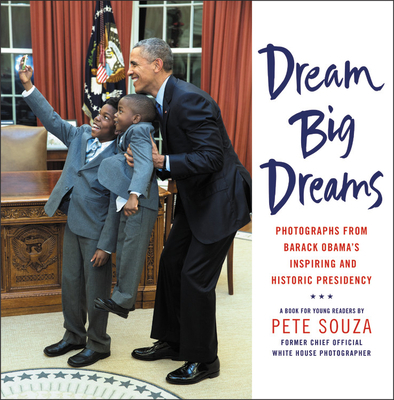 With behind-the-scenes anecdotes of some iconic photos alongside photos with his family, colleagues, and other world leaders, Souza tells the story of a president who made history and still made time to engage with even the youngest citizens of the country he served. By the author of Obama: An Intimate Portrait, the definitive visual biography of Barack Obama's presidency, Dream Big Dreams was created especially for young readers and not only provides a beautiful portrait of a president but shows the true spirit of the man.